I knew that I had to read The Affair of the Bloodstained Egg Cosy when I saw a quote of the author's above the blurb, which read as such: "I prefer villains to be nice, refined people, the sort who quote Shakespeare and knock off their nearest and dearest between rubbers of bridge." There's something quite quaint about genteel murder mystery and I haven't read any Agatha Christie in a while, so this seemed like the perfect choice. 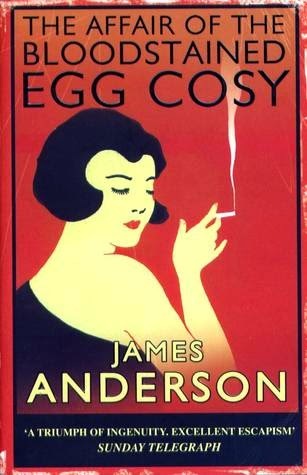 The Affair of the Bloodstained Egg Cosy takes place at your typical Golden-era detective mystery style aristocratic home by the name of Alderley, where an informal party goes horribly wrong. In attendance are politicians and diplomats attempting to carry out top secret negotiations, an American millionaire who has come to Alderley to view the resident earl's gun collection, along with his wife who has brought her thief-temptingly expensive diamond necklace with her. Add to this an unexpected guest who is hiding more than she's telling, and things can only escalate from there. Unsurprisingly, one of them turns up in the nearby lake in the same night as several thefts and a lot of chaos, at which point the self-deprecating Inspector Wilkins makes an entrance. I feel kind of conflicted about this one. On the one hand, it is competently written and is very readable. On the other, it is riddled with things that feel utterly wrong in a murder mystery. The first thing that comes to mind is the pacing. When you have 37 chapters and a prologue, it should not take until Chapter 16 for something in any way criminal to happen. It sort of felt like there was a lot of focus on interactions that could have been condensed or cut altogether, especially with some of the stuff about the gun collection. It also means that Inspector Wilkins, the only character to be named on the blurb, has very little time to actually be characterised in. About the only thing I can really say about him by the end is that he constantly underplays his own abilities and grumbles quite a lot about how he'd rather be working traffic. Not especially impressive character building. The same could be said about the other characters: they're given enough personality to create an archetype of sorts, but nothing to really give them flavour. And that's a real problem when it comes to trying to solve the mystery. When all the big twists came up, I could see the logic behind them, but felt cheated because there wasn't really any way to predict them coming. Often, reasoning would stem from certain lines and odd slips of behaviour noticed by more perceptive characters, but there's nothing in the text itself to really highlight them as being important enough to be clues in the first place. The biggest example of this is the final revelation of the killer's identity, as it reworks an established bit of character backstory that I had no reason to consider at all after it had been mentioned, let alone question. It felt kind of entirely out of left field and I still don't know how anyone was supposed to have guessed it.